The teams from the United States used their camera to find Pemba underneath the rubble so they could figure out how to extract him. That job entailed a delicate balance: removing the youngster without causing a heavy metal shutter above him to fall. L.B. Basnet, the Nepali Armed Police Force officer who crawled into the crevice to retrieve Lama, said that when he attempted to pull Lama out, the shutter threatened to fall, so he used a jack to hold it up. Rescuers added more jacks to prop up the concrete slabs, which were tenuously held in place by twisted ropes of steel reinforcing rods. Two of the concrete floors of the hotel were vertically suspended in front of the building. Lama said during his six-day ordeal under the rubble he suffered terrible hallucinations, commenting, “There were times when I thought I was dead and then I would wake up again to find myself beneath the rubble. I survived on ghee [clarified butter] that I found in a bottle there, scraping until the last dollop to feed myself.” He said he saw a bright orange excavator that Nepali rescue teams were using to clear rubble, and he yelled for help. 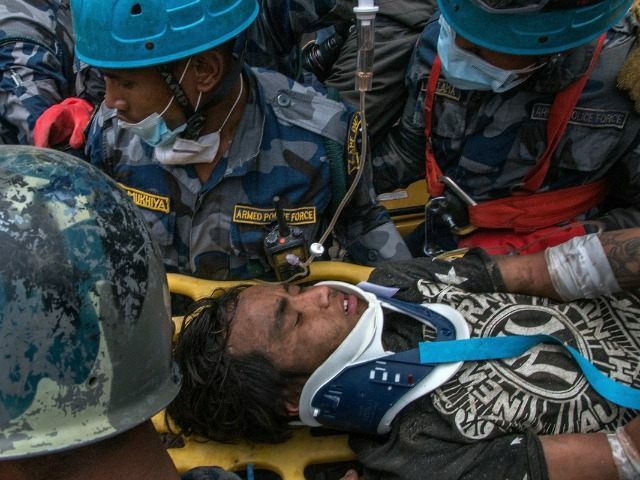 Narayan Thapa, the on-scene commander for the Nepali Armed Police Force, said rescue workers were continuing to search for two other children whom Lama had said were trapped in the debris. Lama told authorities on the scene he had been able to speak with the two children, a girl of about 6 and a boy of 12 or 13, until about 4 a.m. Thursday. Rescue teams were still looking for them in silence so the listening devices could function more effectively. Since the earthquake on Saturday, according to Nepali authorities, 5,582 people have died, and 11,000 have been injured. Officials have been torn on when to halt rescue efforts. On Wednesday, Brig. Gen. Davendra Bahadur Medhasi said in a letter to the Home Ministry that finding survivors was unlikely, and foreign rescue teams should return home, but the same day, a French team rescued a 27-year-old man alive in a building in Kathmandu.